Right Now You Can Play a Console-Quality Video Game from ... YouTube? 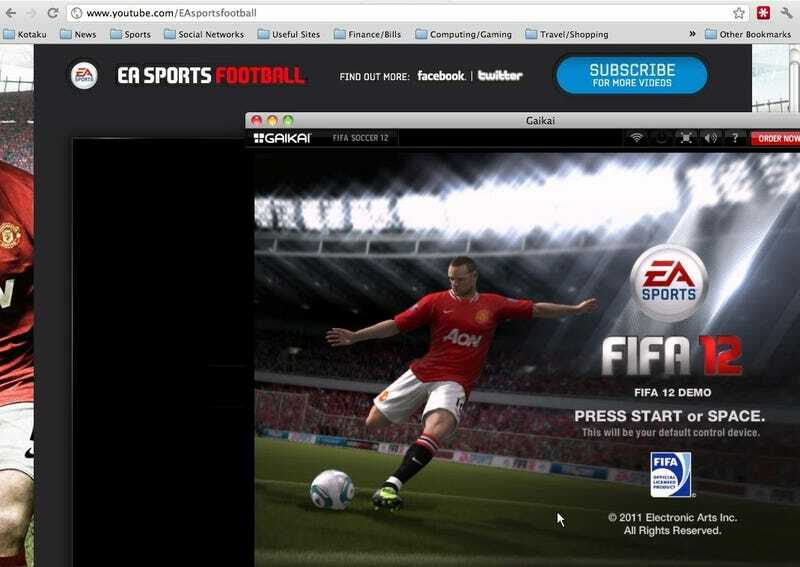 To very little fanfare, the PC demo of FIFA 12 is now playable without a download. All you have to do is go to the game's YouTube page. Provided you have a decent Internet connection and up-to-date Java, simply clicking a banner puts you on the pitch. The development was Tweeted out about three hours ago by David Perry, the CEO of Gaikai, the cloud gaming company that is serving the demo. I just tested it myself (MacOS Leopard, using Google Chrome) and it worked brilliantly. I had to close some bandwidth-hogging Internet applications but in a matter of moments I was taking AC Milan against Barcelona. Seriously. Go to the EA Sports Football YouTube page and try it for yourself. The demo recognizes your input device and standard mouse and keyboard controls apply, so there's no need to have a PC compatible gaming controller. The game is powered entirely from Gaikai's cloud. The demo launches in a separate window, so this isn't like you're playing it within the YouTube video itself. But that's somewhat beside the point. What Gaikai is doing for publishers here is allowing them to serve a game to interested gamers right at the point where they're marketing it. Say there's a new hype video of some feature or gameplay; people go see it on YouTube, then click a banner and start playing the demo to experience it for themselves.